Pie Control is a free Android app that lets you set up hidden menus that pop out of the corners and/or sides of your device that you can fill with whatever you want, giving you instant access to them whenever you like. For example, if you’re always opening the Chrome browser, your mail app, and a few of the same websites, and like to disable Wi-Fi when you leave the house, just add a button for each and then slide your finger to pull out the menu and quickly select whatever you need. Pie Control is a free app available from the Google Play Store, so you don't have to root your device or worry about setting up the Xposed Framework just to get the cool menus. The app is free for the most part and probably doesn't need to be upgraded for most people, but there are some options that you can’t use unless you pay for the premium version. More on that below. All of the above is accessible from the pullout menu, and the Pie Control app is what lets you customize all of it so that you can pick exactly what your pie menu should contain, what color things should be, how large the icons should appear, how much of the screen the menu should take up, what icons to use for the apps in the menu (you can install icon sets), how many columns folders should have, etc. Pie Control isn’t limited to just one menu. Not only can the side/bottom menu be different than the menu pulled out from the corners of the screen, but each launcher also has multiple levels that make up the pie-like menu, and each option within each level can hold a long-press option so that every slice of the pie can have two functions. The premium version of Pie Control gives you a few more features if you need them, but the free edition is still highly usable as-is. The side/bottom menu supports three levels but only the first and half of the second are free (20 total buttons). No other buttons (the other 30) or remaining levels can be added unless you pay. Only the first level of the corner menu can hold buttons (there are six) unless you pay to unlock the other two levels (to get 24 more buttons). One folder can be edited in the free edition, while the premium version lets you add more. To get the premium version, just select one of the premium options within the app, and then tap PURCHASE when asked. The menu button on the bottom right side of Pie Control lets you switch between the options for the Side menu and the Corner menu. Tap one to open those controls, which are described below. This is also where you find the User resources menu for manipulating folders, URLs, and notepad entries. Backup & Restore lets you back up everything related to your menu, including any buttons, custom size configurations, URLs, etc. After selecting Side or Corner from the main menu, the AREA tab is where you can adjust how the menu is accessed. As you can see, the Side menu here is pretty tall (Height is set to max) which means that I could swipe in from basically anywhere on that side to invoke the menu. However, I've set mine to be not very thick (Width is small), so it won't be as easy to accidentally trigger the menu, but also might make it harder to open the menu when I want to. 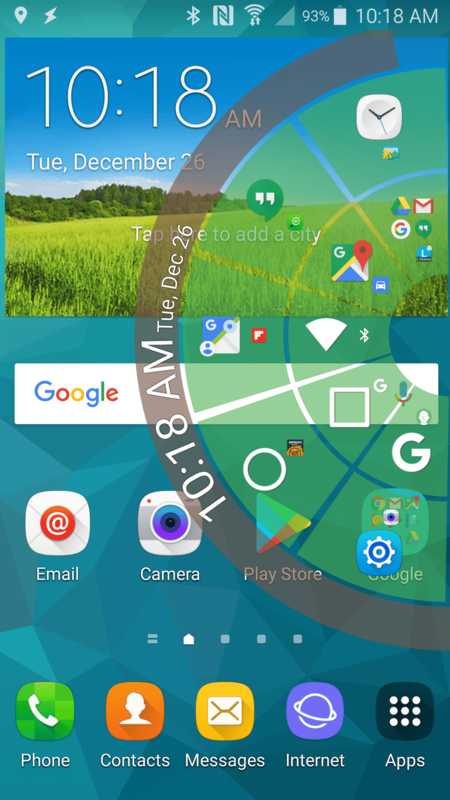 The Position of this menu is set to the middle, which means that since this is for the Side menu, it's positioned directly in the center of the side of the screen and can be opened when sliding in a finger from anywhere in that area. You can change these settings to be whatever you want, and if you scroll down a bit further, you can see that the left, right, and bottom menu can all be unique sizes and positioned on the screen differently. Any changes you make are previewed for you in red as you see here. The Horizontal menu is the same but designates how the menu should appear when the device is in landscape mode. Level1 Buttons in Pie Control. You can see in the screenshot at the very top of this page that Pie Control separates buttons into different layers which are called Levels. Levels are broken up into buttons that when pressed, will open whatever it is that the button is set to, which we explain below. However, within each button is also a sub-button that is only usable if you long-press on the primary button. LEVEL1 is closest to the center of the menu. That is, closest to the side, bottom, or corner of the screen (depending on the menu you're using). Buttons added here are in the innermost part of the circle. LEVEL2 and LEVEL 3 are subsequently further from the center of the menu and reach more into the center of the screen. LEVEL3 is not supported in the free version of Pie Control. Apps: Select this to pick any installed app that you want to have as a button in your menu. Shortcuts: Use this to put a shortcut to any of these things in your menu: books, contacts, direct dial, direct message, directions, Dropbox folder, music playlist, current traffic details, and more. Tools: Use this menu to invoke search, home, back, recent apps, or to open/create notes. It can also be used to add Android controls to your menu like for taking a screenshot or toggling Wi-Fi or Bluetooth on/off. Web shortcuts: Use this to make a button that opens a URL of your choice. Folders: If you want your button to take you to a folder you've made (see below), then use this option. The bottom option you see here ("Lifewire," "To NYC," and "Bluetooth" in this case) is the long-select option that is only accessible in the menu when you press and hold down on the primary function ("Chrome," "Maps," or "Wi-Fi" in our example). Long-select options are identical to the single-select ones with the only difference being how they're accessed in your menu. User resources is an option in the main menu of Pie Control that takes you to the area where you can edit the default folder, add more folders (if you paid for premium), change or add URLs, and make notes that you can see from your menu. The folder is a great place to add actions that are related, but it can really be used for anything, like to expand the menu without paying for access to extra levels. You can rename the default folder and add all sorts of things there, like app shortcuts, URLs, and anything else supported by Pie Control. The WEBS menu is where you add URLs that you want to put into your menu. Once you've made some, just choose one from the Web shortcuts option when you add a new button. NOTEPAD can be used to jot down quick notes or reminders so that, much like everything else in this app, you can quickly access them again if you add Notepad as a button (from the Tools section). Within the Side and Corner menus is a tab called OPTIONS that lets you adjust some more settings. It's here that you can disable or enable the clock and/or battery bar, as well as choose how large the pie menu and icons should be. Use the color options at the bottom of this screen to choose a background color for the whole menu (Pie color) and battery section (Battery bar color). Next to this menu is another called DETAIL OPTIONS where you can pick a different way that the buttons are selected, like to require a tap instead of just a slide-to-select action. Some other things you can change in this menu is the long-select delay time, a toggle to switch to a 24-hour clock, and an option to disable the battery bar background.